Hardcastle Restaurants Pvt Ltd (HRPL) is in an exciting phase in India with new store formats, digital interventions and menu innovations. Business has been on an upswing with 10 consecutive quarters of positive same store sales growth. 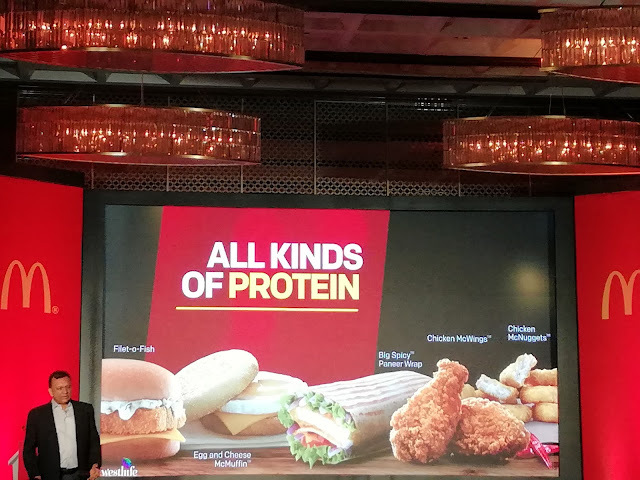 To add to this excitement, the company, master franchisee for McDonald’s restaurants in west and south India, today announced ‘The Good Food Story’ to reinforce its commitment towards promoting nutritive and wholesome food. McDonald’s has been serving the Indian palate for the last 22 years. Over the years, it has developed an indigenous menu completely unique to India. The brand has always been cognizant of Indian sensibilities. It has kept its vegetarian kitchen separate from the non- vegetarian kitchen. The company also does not serve pork and beef in any of its restaurants in India. McDonald’s strength lies in its ability to continuously evolve and remain relevant to its consumers. The Good Food Story is one such journey that the company has undertaken to bring nutritious and wholesome food to them. The food giant has developed a menu that offers a wide array of choices to suit different preferences. There is a range of high protein products that have paneer, chicken, egg and fish. McDonald’s is the only restaurant chain in the Quick Service Restaurant space in India that has a special breakfast menu. The Sausage & Egg McMuffin, Egg & Cheese McMuffin and Scrambled Eggs to give just the right start to the day. Outside of the signature burgers and fries, the company has launched Chatpata Naan- a truly Indian delicacy with an international form. With the recent launch of rice having the goodness of bulgar, basmati rice and fresh vegetables in select markets, McDonald’s has ensured there is something for everyone. The menu also offers a plethora of sides and desserts to complete a meal. Through McCafé, it offers a range of over 30 cold and hot dairy and fruit based beverages. This part of the company’s Good Food journey is what customer will be able to see in stores. But there is another path that the company has taken to ensure nothing but the best is served to its consumers. Naaznin Husein, President, Mumbai Chapter of the Indian Dietetic Association (IDA) said, “Reducing salt and overall sodium content of the products are small yet significant steps initiated by McDonald’s. The effort taken to re-engineer their food towards a healthy shift is a good initiative. Using technology innovations to reduce overall fat content may be a sustainable solution towards responsible nutrition. For HRPL, nutrition and wholesomeness is not a ‘tick box’. The company has worked on products across the board to make them better. Food is like technology, ever evolving and McDonald’s promise is to keep changing and responding to its customers to give them the best experience. This by no means is the end, the company will continue this journey and come back with more of what its consumers want! Experience the goodness of McDonald’s wholesome food at a restaurant near you!